8 sinewave generators for Oscillator 1 and the brilliant new Filter Control Section which allow sweeping and tweaking the discrete filter types in real time (as opposed to unreal? ), set this NovaMusik-partnered Omega Series Synth apart from our beloved, standard issue Omega 8s. Clever switches in the Filter Control Section also contribute to the CODE's expressiveness via momentary control of assignable parameters, and full panel control—secluded behind veils of edit windows in the Omega—of the auto-triggering External Audio Input, jack you wholly into the synth's processing and punctuating power. 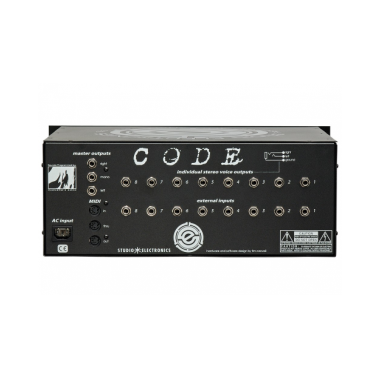 All models are available in an "OD" version; as in warm and fuzzy classic analog amp overdrive for each stereo voice. Start out modestly with a Mono CODE and work your way up (2, 4...) to a figured eight. As with the Omega 8, the CODE is powered by S.E.M. and Mini filters, which are standard, 128 Multimode patches, 512 Factory Presets. Two voltage controlled discrete analog oscillators, one sub wave of Oscillator 1, waveforms: sine (OSC 1), triangle, sawtooth and variable width square; simultaneous waveforms output; syncing of Osc 2 to Osc 1. 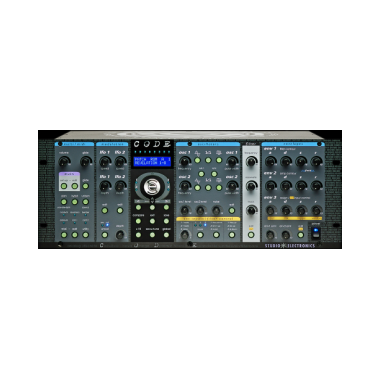 Two voltage controlled discrete analog filters: 12 db (classic Oberheim® style) hard-wired into voice board; 24db (classic Moog® style) in docking slot 1; 2 additional filter docking slots; 2 and 3 can host our classic Roland® 303, Arp® 2600, and Yamaha® CS-80 styled, all hardware filters; 12db filter modes: low pass, bandpass, high pass and band reject. Filters do not operate in series or parallel. Each voice can access all four filters. Sweep through all the filter types in real time. Increase or decrease the filter frequency. 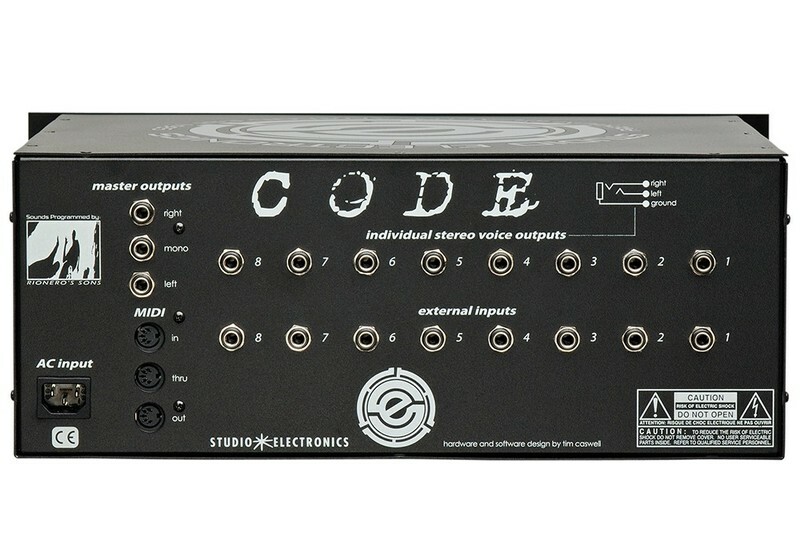 Controls CODE synth engine or external input. configured as a 4 input or quad filterbank. 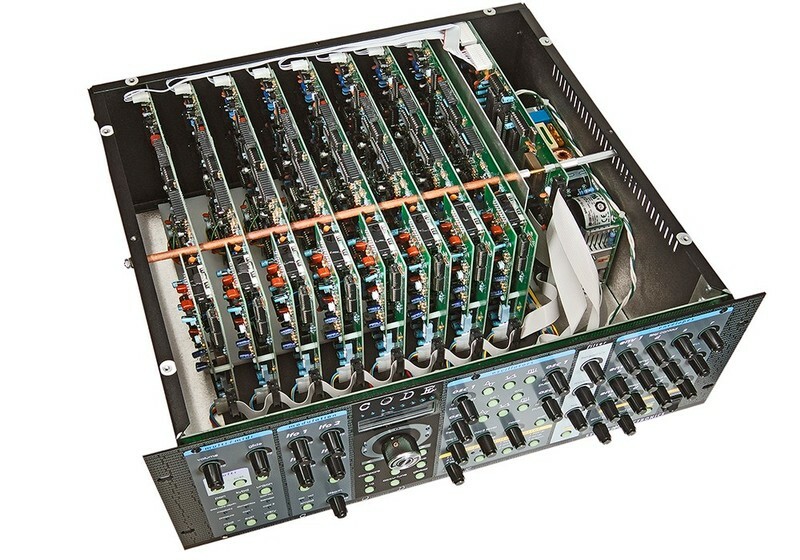 configured as an 8 input or 8 channel filterbank. Each voice card has two empty expansion slots for extra filters: the S.E.M. 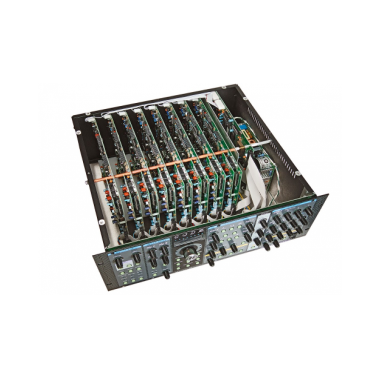 filter is built in and the Mini filter sits in expansion slot 1; three expansion slots total, as is the case for all Omega Series Synths. Three multiple stage envelope generators: attack, decay, sustain and release with inverting and multiple triggering; additional delay, decay 2, and breakpoint parameters for envelopes 1 and 2; assignable 3rd envelope with up to three destinations and depths. Envelope 1 fixed to filter frequency. Envelope 2 fixed to amplifier level. Envelope 3 knobs also can control the external inputs. One, two, four, six, or eight voices depending on voice configuration. Prepared: one MIDI channel, up to eight different patches (synths); split: set point; layer: 4-4; multi: channelize up to 8 patches (synths).